I feel like a bad reader for only ambiguously loving this book! This feels like one of those "there are two kinds of people" books, and I'm so much less cool for not being a part of the cult following. Which is not to say I didn't appreciate the charm of this book. It is very charming! Just: I was put off by Helene's brashness, her taste in books, her sense of humour (which I felt came off as mean), and mostly the writing about books. 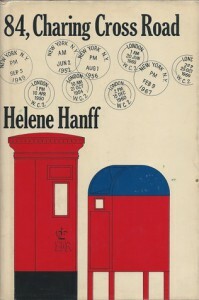 Helene valued books differently than I do, and while I recognized that her sky-high highbrow tastes are superior to mine, I had a hard time relating to her (mock?) outrage upon receiving an inferior edition of whatever. She treats books like wine snobs treat wine [and, in my opinion, being unwilling to appreciate fiction is like being unwilling to drink any white wines], whereas I am a casual wine drinker who likes many types of wine. Great wines are nice! But I have been known to make do with just a fun wine without complaining in the least. Also, FICTION. That being said, I also loved her moth-eaten sweaters, her preference for used (as opposed to new) books, her gratitude, her generosity, and her insistence on bringing as much humanity as possible into a business relationship. I read this book in an unusual way: I started it without knowing the first thing about it, which included not noticing until I was near the end that the main character's name was the author's name (ie., it's not fiction). Once I realized that I was reading real people's letters and not a novel, I like the book more. I can't figure out why that is: as fiction, this book is kind of terrible, but as real life, it's sweet. The reader who sent me my copy included Hanff's obituary, clipped from <i>The New York Times</i> and tucked into the back flyleaves, which made for a very touching epilogue. I wouldn't really recommend this book except to people who are obsessed with books <i>qua</i> books. If you drool over specific copies of historical British works of non-fiction, this is for you! But it left me a little cold.